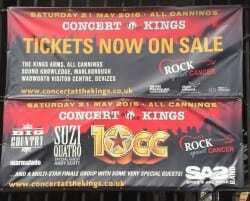 Kennet Sign & Display are proud to be sponsoring Concert at the Kings for the 5th year running as they celebrate their 5th anniversary with a star studded concert on 21st May 2016. Since the first concert in 2012, Concert at the Kings has raised over £112,500 for cancer charities and The Parish of All Cannings. For 2016 the event will support three cancer charities. Macmillan Cancer Support, Bristol hospital support charity, Above and Beyond’s new fund Act to Beat Cancer and mobile chemotherapy unit charity, Hope for Tomorrow. A portion of the money raised will also go to funding projects within the Parish of All Cannings. Tickets are available from The Kings Arms in All Cannings, Sound Knowledge in Marlborough and The Wadwoth Visitor Centre in Devizes.